I wasn’t sure whether to talk to you about this or not. But this news is important to me and so are you. My grandfather passed away a few days ago. He was 92 years old, and had been unwell for a few weeks now. While his death has left a large gap in our lives, we are all grateful for the long and fulfilling life that he has lived. We are in a reflective state of mind, and wish him a peaceful after life. All of us are looking for our own way of dealing with this loss. My father for instance is being very positive. This morning, after reflecting all night, he mentioned that he wants all of us to remember him for the full and respectable life that he had led, where he was loved by friends and family, respected professionally, revered by most for his integrity, and known for his strong resolve. How many of us can boast of such accomplishments? While he always believed in moderation, in his last hours, he was picky about what he ate. Since I had the pleasure of spending his last few days being around him, I would cajole him with dishes I prepared specially for him. One such dish was this healthy version of Paneer Makhani. Staunch punjabis would disagree and call it blasphemy to use healthy and paneer makhani in the same sentence, but these days the family has become quite health conscious. I’ve come up with a version that tastes just as delicious, without all the additional fat, but I’ll let you decide. I’m also submitting this recipe for Angie’s Fiesta Fridays. Its a fantastic place for bloggers to come together and hats off to Angie, Juju and Amanda for hosting this week’s event. 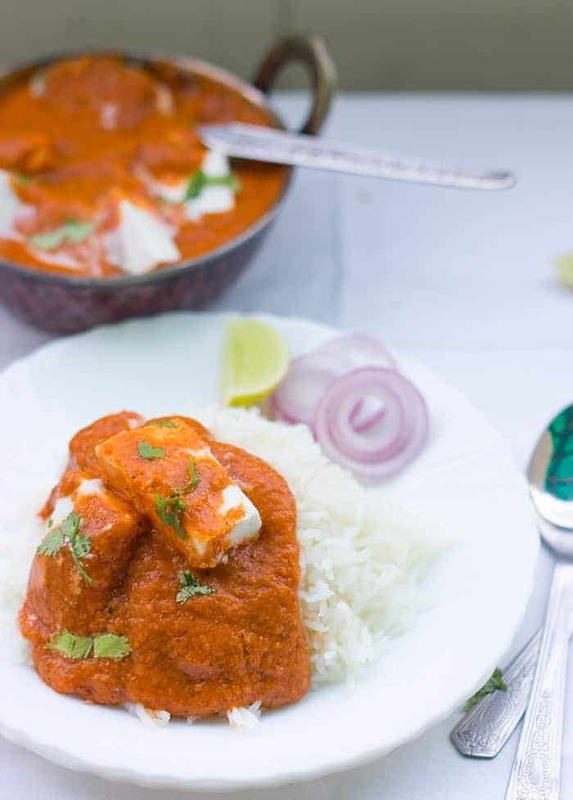 A healthy, low-fat version of the popular Paneer Makhani, but just as flavorful. The thick, luscious gravy substitutes yogurt for cream. In a pressure cooker, add tomatoes, onions, garlic, green chillies, red chillies, cashewnuts, khus khus, bay leaf, cinnamon, cloves, cardamom and half a cup of water. After 2 whistles, switch off the flame and set aside to cool. Once cooled, fish out the whole spices (bay leaf, cinnamon, cloves and cardamom) and puree the rest in a blender till smooth. Add oil and butter to a pan. Once hot add the pureed mixture and tomato ketchup and simmer for 20 minutes. Add salt and garam masala. In another pan, dry roast the kasuri methi and then grind to a fine powder. Add to the gravy and cook for five more minutes. Just before serving, add the beaten yogurt and paneer. Serve with chapatis or rice and a side of onions. Garam Masalas can vary slightly in taste and strength. Please adjust quantity as required. In case you don’t have a pressure cooker; in the first step, start by sauteing everything except tomatoes in a non stick pan with a teaspoon of oil for fifteen minutes. Add tomatoes and cook for another ten minutes. After which, follow instructions from step 2. Thank you vdreams, it was a difficult time for all of us. And I’m so happy you liked this recipe. The gravy is the star of this recipe, and you can add anything to it! Though a lil late but condolences to u n ur family! Sorry for ur loss! Anne it was, and we miss him so much! Hey Kapil. I’m sorry that’s not clear in the recipe. Please add the khus khus with the rest of the ingredients in the pressure cooker. I’ll correct this in the recipe as well. Thanks for pointing it out! so when do u add the khus khus in the whole recipe???? I’m so sorry for your loss; your grandfather sounds like a truly remarkable man. Your recipe looks delicious, and it’s a lovely way to remember good times spent with him. I am so sorry to read about your loss. Beautiful recipe though – pinned to try later! This dish look so yummy and so healthy! Thanks for the recipe. Sorry about you loss Richa. Healthy Paneer Makhani? I am all in! Thank you Sandhya. Its a difficult time but the entire family is trying to be positive and get back to normal as soon as possible. heartfelt condolence !! It’s a hard phase but one does need to accept it . Sorry for your loss and your Dad’s way to look at things is indeed a positive one. The Makhani looks lovely! Light and healthy and such a simple and quick recipe 😀 Happy FF! Thank you James 🙂 Happy FF to you too! Hey Jhuls! Thanks for stopping by 🙂 Happy FF! Hey Judi! Thanks for stopping by 🙂 And I really hope you try this out. Happy FF! What a lovely tribute to your Grandfather. So sorry for your loss. I too lost my mother in law about 3 months ago at the ripe old age of 94. We too felt we were very fortunate to have had her for all that time, she was one amazing lady who’s life spanned a few continents. I dedicated a blog post to her too – Tomato Cutlets and my mother in law. I love your paneer makhani and have bookmarked it for a future try. Again, condolences. Oh! This looks so mouthwatering! Pretty photos, too. 🙂 Happy FF. This looks very delicious! I’m sorry to hear about your grandfather – it’s so nice though to be able to reflect back on his life and recognize that it was long and fulfilling. Btw, happy FF. I honestly wasn’t sure if I could even moments before I clicked submit. Thanks for your condolences. I’m so sorry about your grandma. I know what you mean. He suffered some in his last few days, but he was still smiling and became almost like a kid. That’s my fondest memory of him – demanding kheer and refusing khichri. Big hug to you too! Hey Amanda! Thanks for stopping by. He did lead a happy life, and all his grandkids were with him when he passed away. He was full of life, even days before it happened and that’s how we’d like to remember him. Thanks for sharing. You are brave for doing so. Sorry about your family’s loss. You have to hold on to the good memories though and pass them along because it’s all we really have. My grandma died under incredibly tragic circumstances and it’s still very hard for me to face the truth of what happened. I find peace in the joy she shared with us. Not that other stupid stuff that took over her body. Food is also a great love of almost any family so thank you for sharing a recipe to remember your grandpa by. Take care. Sending you hugs.